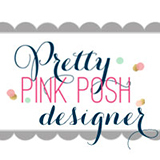 Welcome to the second day of the Pretty Pink Posh March 2018 Product Release Blog Hop! If you arrived here from the Alix Davis’s blog you are on the right track. To create the card, I stamped flowers & leaves (from the Cherry Blossoms stamp set) and the sentiment (from the Encouraging Greetings stamp set) on watercolour paper panel in black pigment ink. I then lightly coloured the stamped images with watercolours and a wet paint brush. I added red ink splatters. For the sparkly rainbow, I stamped it from the Best of Luck set on white card stock using Memento Desert Sand dye ink, die cut it with the coordinating die. Once the watercoloured panel was completely dry, I mounted the panel on top-folded kraft card base using double-sided tape, adhered the stamped rainbow die cut above the sentiment, and then added Jewels on it using fine tip glue pen. I love these new sparkly Jewels so much!! For my second card, I created a messy watercoloured flower card with the Cherry Blossoms stamp set. I stamped flowers and leaves on watercolour panel using Antique Linen Distress ink first, and then coloured them with Worn Lipstick, Mowed Lawn, and a bit of Wild Honey Distress inks. Next, I brushed over the coloured images with clean water – Distress inks react with water! Once the floral panel was completely dry, I mounted it on white card base using double-sided tape, and then added details of the images using 0.05mm Copid multiliner, white ink splatters. For my last card, I am featuring the Cherry Blossoms set and the Stacked Edges 2 die. I die cut 4 diamond stripes from watercolour paper using the Stacked Edges 2 die first, and then inked stripes with Distress inks and round ink blending tool. For a cluster of flowers, I stamped & watercoloured them, then die cut them with the Cherry Blossoms coordinating dies. I added Jewels for finishing touches. This entry was posted in Pretty Pink Posh, Watercolor cards and tagged Blog hop, Flower, Pretty Pink Posh, Watercolor. Bookmark the permalink. Fabulousness! Each one different but amazing in itself. I love what you how you’ve used the gems. Well done. So many beautiful cards! Thank you for all the inspiration. Your cards made me smile! Loved them! Gorgeous cards! I love your jewel rainbow! Beautiful cards! I love your watercolouring. It is definitely a talent you’ve been blessed with. You have created three very beautiful but different cards using the same stamp set. Your coloring skills are awesome and your designs are lovely. Thanks for sharing your creativity! Your cards are beautiful! I especially like the last one with the stacked edges. Beautiful stamps too! Absolutely gorgeous cards, Yoonsun! I especially love the last one with those diamond stacks & awesome coloring. I NEED those dies!! I always love your messy water coloring! These cards are fabulous! Another beautiful set from Altenew and I love the watercolors. So beautiful! Gorgeous cards! Love those beautiful cherry blossoms and your awesome coloring! Love that sparkly rainbow on your first card! And such an awesome die from the Stacked Edges 2 die set… can’t wait to get that! Congrats to PPP on a fabulous release! These cards are simply amazing! I love also how you used Stacked Edges 2 and didn’t have them totally touching each other! Beautiful! Love these awesome cards! The Stacked edges dies ate wonderful & I love the soft colors you used on them. I NEED those dies!! Beautiful card! I love the soft geometric shapes and the lovely florals. Each card so unique and so pretty! Gorgeous cards!! Those cherry blossoms!! Beautiful!! Your first card was so beautiful, then I got to the second card and I thought “oh my gosh this was so beautiful too”, and then I saw the third card and I was blown away! Every single card was outstanding! I love your ideas, i’m going to try the watercolor with distress inks technique. Thank you for the inspiration ! Fun and gorgeous cards! You so perfectly and beautifully highlighted the products. Amazing cards. Your style and coloring are so unique and colorful. I loved your jeweled rainbow on your card! The cherry blossoms are so stunning! My favorite flowers are cherry blossoms and I just adore the coloring on it! Such gorgeous cards with the lovely flowers and pretty sequins!! What amazing cards Yoonsun – they are beautiful – love your ‘trade mark’ messy watercolour painting! WOW! Once again you blow me away. I just love that jeweled rainbow the best! But you know me… I always love a good rainbow so there’s no surprises there! They are all absolutely stunning and oh so beautiful!!! all the sparkle & shine ooooh la la love them all!! All your cards are simply perfection ! Oh, I love your style! The loose watercoloring looks so beautiful in all it’s forms, and I especially love seeing it paired with the very regimented rainbow and the diamond die cuts. Such a beautiful set of cards. Thank you so much for sharing! love each and every single one of your cards, very inspired to attempt water coloring again!! your cards are awesome, I love all your cards, there are amazing! Beautiful cards! I love the shiny rainbow!